Andrew Hines remembers begging his father, Byron, to take him to the Chevrolet Performance U.S. Nationals for as long as he can remember. Nearly three decades later, the five-time Pro Stock Motorcycle world champion gets just as excited for the world’s biggest drag race. Competing as the defending race winner in Pro Stock Motorcycle and with the team’s new Screamin’ Eagle Vance & Hines Harley-Davidson Street Rod making its first appearance at the Big Go, there’s even more for Hines to be thrilled about at this weekend’s 63rd annual Chevrolet Performance U.S. Nationals at Lucas Oil Raceway at Indianapolis. 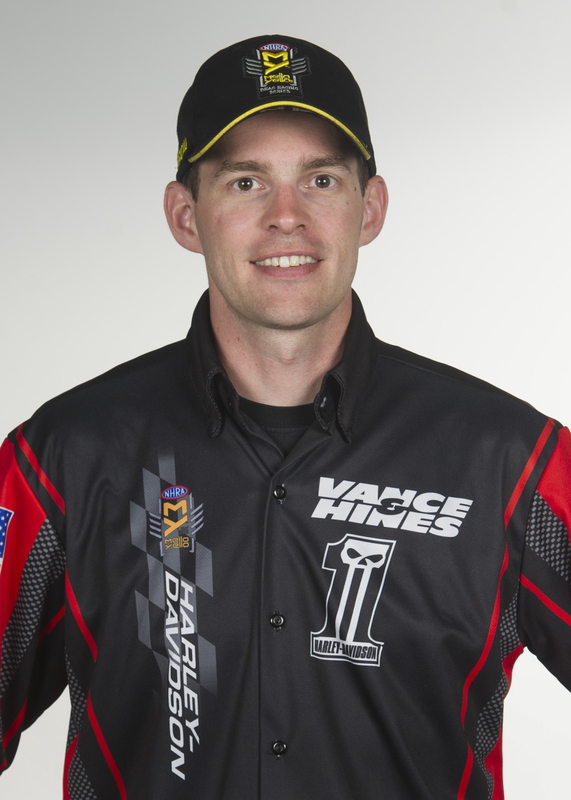 The victory in 2016 at the prestigious race also marks Hines’ last win, which has him aiming for a repeat win more than ever. Tony Schumacher (Top Fuel), Matt Hagan (Funny Car) and Chris McGaha (Pro Stock) were last year’s winners of a race that will be broadcasted on FOX and Fox Sports 1 (FS1), including a live broadcast of finals on both FOX and FS1 on Monday, Sept. 4. 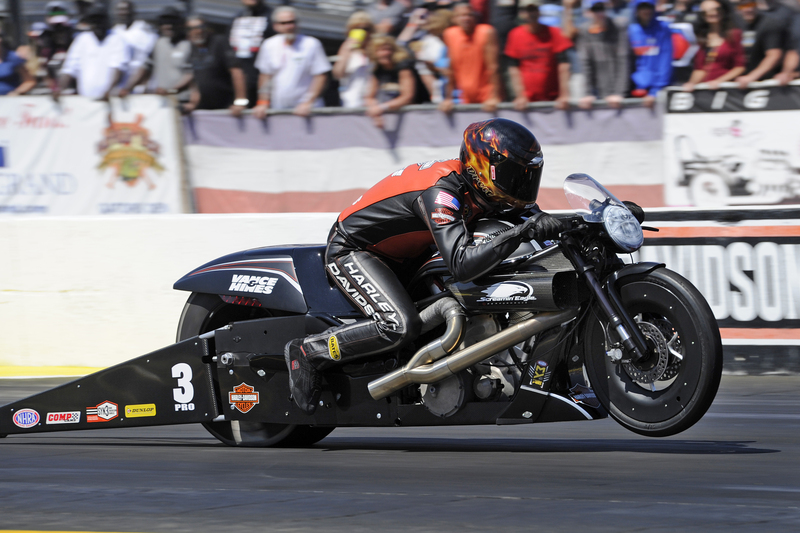 Drag racing’s grandest event is the 12th of 18 events in Pro Stock Motorcycle and the final race of the NHRA Mello Yello Drag Racing Series regular season, with the six-race Mello Yello Countdown to the Championship to follow. Since debuting the new Street Rod in June, Hines and longtime teammate Eddie Krawiec have been busy working out the kinks. Krawiec won in Denver and Hines, who is sixth in points, had his best showing on the new bike at the most recent race in Brainerd, advancing to the semifinals. That’s a good sign for Hines, who hopes to be at his best at Indy and beyond. There is definitely work to be done in a loaded Pro Stock Motorcycle class that will have 22 standout riders competing for a prestigious Chevrolet Performance U.S. Nationals win. LE Tonglet, who has five victories this season, and teammate and defending world champ Jerry Savoie, who has two wins in 2017, are at the top along with Krawiec, but Hines believes it is just a matter of time before he breaks through for the first time this year. Doing it at the world’s biggest drag race would only make that first breakthrough this year even sweeter. Top Fuel’s Schumacher etched his name in Chevrolet Performance U.S. Nationals history a year ago, becoming the first NHRA driver to reach 10 wins at the prestigious race. He’ll look to add to his legacy against points leader Antron Brown and six-time 2017 winner Steve Torrence. Hagan grabbed his first career Indy win last season in Funny Car and has three wins in 2017. He’s currently chasing reigning world champ Ron Capps, who has six wins this season, and Robert Hight, who won two races during the NHRA’s Western Swing. McGaha’s first Indy win in Pro Stock came a year ago. Greg Anderson has six wins at the Big Go, second to only Bob Glidden’s nine at the race, while others to watch include points leader Bo Butner, rookie Tanner Gray and Drew Skillman. Bonus bucks are on the line for qualified drivers in Top Fuel and Funny Car in the lucrative Traxxas Nitro Shootout. Top Fuel will run on Saturday evening, while the Traxxas Nitro Shootout for Funny Car is contested on Sunday. Traxxas Nitro Shootout winners will earn $100,000. Schumacher is the defending winner in Top Fuel, while Courtney Force was the 2016 winner in Funny Car. Drivers in the NHRA Lucas Oil Drag Racing Series and the NHRA J&A Service Pro Mod Series also will look to become winners of the prestigious event. The fastest Super Stock cars will challenge for ultimate bragging rights and bonus purse during the popular Mopar HEMI Challenge. After Nitro qualifying, fans can watch the spectacular Muy Caliente Racing jet dragsters sponsored by Lucas Oil and the Larsen Motorsports jet dragsters sponsored by Florida Tech and Matrix System. Jet cars are thrust driven propelled by jet engines with exciting pre-run flame shows. A special Monday edition of the SealMaster NHRA Track Walk also will take place prior to final eliminations, where many of the sport’s most celebrated drivers will walk alongside fans down the historic dragstrip. Fan-favorite vintage racecars will be on display in the Hot Rod Junction, along with several autograph sessions featuring the biggest stars of the sport will be featured. The first of five Mello Yello Series qualifying sessions is scheduled for 7:15 p.m. on Friday, Sept. 1. Two more sessions will take to the track on Saturday, Sept. 2 at 2:30 p.m. and 6:15 p.m., and the final two qualifying sessions will take place on Sunday, Sept. 3 at 11:30 a.m. and 3:15 p.m. Final eliminations begin at 11 a.m. on Monday, Sept. 4. The Traxxas Nitro Shootout for Top Fuel will be contested Saturday, Sept. 2 with rounds at 3:45 p.m., 5:45 p.m. and 7:40 p.m. The Traxxas Nitro Shootout for Funny Car takes place on Sunday, Sept. 3 for the eight qualified drivers, with rounds at 12:45 p.m., 2:45 p.m. and 4:40 p.m.